Last year we introduced our 'View from Above' category for images of our planet's landscapes from the skies, whether shot by drone, aeroplane or helicopter. We received some fantastic submissions, including Tom Sweetman's winning image of Chiang Mai [see post below]. Drone photography is an incredibly new discipline. Although enthusiasts have been using a variety of remote-controlled aircraft equipped with specialist cameras for quite a few years, small multi-rotor drones with cameras have only become commercially available to the general public since about 2012. This makes it all the more astonishing that the standard of drone-based aerial photography has made such great leaps in such a short time. The big breakthroughs came when the camera could be effectively stabilised, and the picture easily controlled and monitored from the ground. Once these technical advances were in place, drone photographers could really unleash their creativity, and they have done this on every continent and in a huge variety of environments, from pristine wilderness to the urban jungle. Further fuel has been poured on the creative fire by the ease and speed of sharing great images online. This has led to a huge cross-fertilisation of ideas and inspiration, making this a very exciting time to be involved in drone photography. I can remember being particularly pleased with my first drone aerial photograph—what now seems a very bland image of some fields. I had the feeling that this was the beginning of something big, but I scarcely imagined that it would blossom so quickly into such a diverse and beautiful photographic discipline. Scarcely a week goes by when I’m not blown away by an original and creative aerial shot, shared on the now ubiquitous social media. In many ways, it’s this sense of rapid progress that makes it all so exciting. What are you hoping to see more of in this year's entries? What I hope to see this year, as I do every year, is to be surprised, to be amazed, to be inspired. To marvel at some hidden gem that someone has discovered, not because the image was shouting from the rooftops but because the photographer took the time to sit, to watch and to learn. A photographer who has the creative eye to see an exquisite image in the most unlikely of places and then crafts an image that so many others would overlook. So often it is the more subtle images that strike a chord with the judges, those little moments or tiny details that can be uncovered anywhere, one just has to look slowly, or creatively enough. This year I’d love to see even more originality, images that make me go ‘Wow’, unexpected angles, amazing lighting, and a great mixture of technical competence and creativity. More storm chasing! I do love to see the extremes of the elements and how people rush out to catch them. I do get quite envious that I never quite get the chance myself. Must try harder! I‘d like to see images that aim to do more than simply document their subject. I'd like to see personal, individual photographs that communicate the photographer’s unique viewpoint. They don’t necessarily have to be high-impact for me. All of the images get looked at more than once and it's those that reward a second, third or even fourth visit that tend to appeal to me. This year’s category winners will each receive a £500 Fjällräven Award to get equipment, garments and accessories to enhance their outdoor photography experience. What would you buy with this money? With £500 of Fjällräven vouchers then it would be the Yupik Parka for me. I routinely work in the most atrocious conditions in the Scottish mountains during the depths of winter and so having a coat for those variables in conditions is invaluable. I’m particularly liking the look of the Keb Touring Down Jacket in Stone Grey & Black for those crisp winter mornings out on the hills. I have a pair of Fjällräven trousers which are my go-to work trousers for shooting in the great outdoors. I probably need to go and get something warmer as my insulating layers are getting a bit past it, and something that lasts is definitely more environmentally friendly. Water and wind proofing are the most important things for me when I’m choosing outdoor clothes. They need to be pretty hard-wearing too! That would guide my choice. Whilst I loved the unique and creative perspective offered by the drone images, one of the standout photos for me was the category winner, and overall winner, in Live the Adventure [Mikolaj Nowacki, see above]. As someone who is not at all comfortable on boats this image represents being about as close to hell as I could imagine. That the photographer has even entertained the idea of capturing images in such conditions, and was able to craft such an emotive image, a raging ocean juxtaposed against the epitome of calm that is the captain, is beyond me. An exceptional image. Another that immediately stood out for me was the runner up [Jose Fragoso. See our interview with him below]. We see so many vibrant and bold colours during the judging process that it is often the more subtle, quieter images that stand out. This has an authentic and calm feel to it and though the backdrop is not obviously spectacular it is these found images, these expertly crafted images, that I personally find so appealing. There were so many great entries, it’s hard to pick favourites. I really liked Daniel Trim’s Ghost Crab from Madagascar. I think it’s partly because I’ve spent time watch and photographing these comical creatures, but also I love the big shadow. In terms of my own areas of expertise, I love the abstract, graphical nature of Tom Sweetman’s drone shot in the View from Above Category, it has some lovely textures and details. In the Underexposed category Saeed Rashid’s shot of the Surgeonfish in the shallows has lovely lighting and composition. Well this actually runs across the last few years but still includes last year. One of my favourites is the Australian storm chaser Will Eades. He may get a little over enthusiastic with his processing but not that much. His images always strike a chord with me and I still can’t believe he has not won something. Simon Baxter’s Light on the Land category winner appealed to me a lot - I think it takes skill and vision to photograph a scene that many would pass by and to find a narrative within it. I like a photograph that rewards a lingering gaze and there are so many details in Simon’s that do just that. Among the images in the book, I particularly like Lizzie Shepherd’s Snow Lines. In fact, I like it so much I have acquired a print of it. It is simple, ethereal, and subtle, taken and processed with a light hand. Having spent many years working as a travel photographer, I was naturally drawn to the images in our Spirit of Travel category. As well as loving the graphic power of Andy Holliman’s category-winning image of the red planes at the snowbound airport in Greenland, I was also taken by Dominic Byrne’s photograph of a woman dressed in bright blue and pink working on a stepwell in Jaipur, India. The lady, pausing her work for a moment as if to take in the remarkable location, brings the subtle tones and symmetrical patterns in the stepwell to life. It’s wonderfully observed and stunningly well composed. What is your advice to prospective entrants? OPOTY is a truly international competition where any photographer, no matter from which country they’re from, has a real chance to win. It has produced amazing books, with a characteristically consistent selection of published images… this says a lot about the seriousness of the project. Therefore, my advice to prospective entrants is to look at the content of OPOTY books, not only because they give you an opportunity to learn something, but also because their image selection guides you in future competitions. How did it feel to be the OPOTY 2017 runner up? OPOTY is one of the most prestigious international nature photography competitions and therefore being the “Wildlife Insight” category winner and the overall runner-up in was a great blessing and it gave me considerable international exposure. The award stimulated me as a photographer and encouraged me to go out again with my camera during the heavy rains – in Kenya, where I live – in search of conditions to shoot photos in beautiful ambiances. Our category prizes this year are £500 Fjällräven Awards to get equipment, garments and accessories. What would you pick from Fjällräven with this money? Fjällräven backpacks, clothing and equipment are amazing quality products for adverse environmental conditions. In Africa, they keep you dry and warm in the rain storms, allowing you to shift your attention on your safety and protection of your gear. Image: © Jose Fragoso. Nairobi National Park, Kenya. NINE DAYS LEFT TO ENTER OUTDOOR PHOTOGRAPHER OF THE YEAR 2017! A few weeks ago we ran a Fjällräven giveaway competition, where five lucky outdoor photographers won a Fjällräven G-1000 Seat Pad. Congratulations to Brian Dulin, Graham Dunn, Andrew Cooper, Perry Tatman and Sarah Kilwardby! Your prizes are on there way to you. As we edge closer to the 9 November deadline for Outdoor Photographer of the Year 2017 (seriously, it’s really not long now...you’ve got just 9 days left to enter! ), we wanted to celebrate this year’s overall winner receiving a Fjällräven Award of £3,000, where they can choose their perfect gear collection. Also new for this year is a runner-up Fjällräven Award of £1,000. To celebrate these amazing prizes we asked some of this year’s judges what they look for in their outdoor equipment. Functionality - it simply has to deliver in the harshest of extremes. I need to trust that my gear will keep me warm and dry, and keep me shooting when everyone else has already gone home. Endurance is paramount. My kit has to withstand salt spray, high winds and standing for long periods knee-deep in the sea, so I look for the best waterproof and windproof, yet breathable fabric. There is more than one factor, but simply put I look for a high quality of material, workmanship and design, and also comfort and detail. The product simply needs to perform. I really like lightweight footwear so I can be relatively nimble outdoors, but found I kept getting very wet feet tramping around in early morning dewy grass. Now my Gore-Tex trainers are among my favourite bits of kit – they’re both lightweight and waterproof. As a landscape photographer I need to be protected from the elements. After that, it’s all about facilitating creativity: where I can stay out longer in bad weather and choose challenging viewpoints like standing in the sea. My umbrella, used mainly as a windshield, and my wellington boots are both ‘take-everywhere’ accessories. Due to my shooting style (I often like to get the foreground in my images) I end up lying on the ground a lot! Therefore I need kit that’s waterproof and durable. Clients sometimes wonder why I'm dressing in fully waterproof clothing when there is no sign of rain – but staying protected is important! On a recent shoot the area of moorland I chose to work in was in fact the shooting dogs toilet! The clothing was put through its paces that day. We all want to win a photography competition, but what does it take to really make the competition judges sit up and take notice of your image. It’s likely that the judges will be seeing hundreds if not thousands of images during the process, so they are not going to study each one in detail to find the hidden wonder that we more readily see in our own photographs. To get through the hoops and make it to the shortlist or beyond, you need to produce something different. Outdoor Photography editor and Outdoor Photographer of the Year judge Steve Watkins offers five insider secrets for making your images rise above the crowd. 1. Good isn’t good enough! This may sound a little brutal but good images will struggle to make it into the final rounds of a high-level competition. There are many good images out there, so that becomes the norm for the judges, and what they are seeking out are the exceptional images; the ones that have that little extra. Without a doubt, the images that always win through are the ones that connect with the judges on an emotional level – strictly representational images are less likely to do this unless there is a extraordinary element, such as stunning weather conditions or a magical moment, in the frame. Strive for excellence in every aspect of the image and it will stand a far better chance of moving the judges. We are all very attached to our own images, as upon seeing them we recall everything that went into the taking of it, from the struggle to reach the location to the feeling of the wind on our faces. If you can’t find a trusted friend or colleague to give you a detached opinion of your images then try turning them all upside down in your processing software and then look at them. The rotation strips away some of the familiarity you have with the scene, which allows the graphic qualities of the image to surface more easily. I’ve often heard photographers on the shortlist saying that they almost didn't submit the selected image, but something told them to include it anyway. That instinct is extremely powerful, because it speaks of emotional power, so tap into it. The obvious images are quite often obvious to lots of other photographers too, and you need to be unique to stand a chance. It’s very hard to be a successful travel photographer as, by the very nature of the work, you are going to new places that you have very little knowledge of and usually spending a restricted amount of time there. Although you can take powerful images at first glance, it is more likely that being familiar with your subject will help you to see it in a fresh way. If you are not particularly bothered about what you are shooting then it’s unreasonable to expect the final image to be elevated to the level required to win a competition. Shoot what you are passionate about. Be yourself. Don’t worry about who the judges are and what they may be thinking. If you try to second guess what they want and set out to shoot that then it is almost certainly doomed at judging time. Be yourself, explore your own interests and shoot in your own style. You are unique, and the images you produce will be unique too if you free yourself from other people’s expectations. Outdoor Photographer of the Year is open for entries until the 2 November. Be bold in your image taking and selection! We can’t wait to see your photographs. One of the most regular pieces of advice our judges offer is “shoot for the competition”. Don’t just submit images that have been sitting on your hard drive for years, study the brief and then get out there and shoot. Luckily, autumn here in the northern hemisphere has some wonderful light and colours to make taking that perfect picture just a little easier. Over on our Twitter page we’ve been asking you where your favourite places to grab those autumn masterpieces are, and the suggestions have been rolling in! 1. Read the rules, and then read them again. Many great images are disqualified because they break competition regulations. Check the format, size, and resolution required. 2. Ensure your shots are flawless. You won’t be there to justify imperfections so magnify your files, make sure key areas are sharp, and check that noise levels are acceptable. 3. Choose your category carefully. Don’t expect the judges to move your submission into a more suitable category if you’re unsure where to put it. Give it some serious thought. 4. Shoot to win. It can be tempting to trawl through your archive and select something that’s half right, but if it doesn’t fit the theme precisely, shoot something that does. 5. Don’t be a slave to cliches. When you’ve selected a category, think about the type of pictures everyone else will be submitting, and make sure yours will really stand out. 6. Try to be original. Look at previous winners, but don’t just mimic the style or content of their pictures. 7. Do the thumbnail test. With so much work to get through, it takes a really striking image to stop the judges in their tracks and warrant a second look - reduce your final selection to a series of thumbnails, and pick the ones that attract your eye first. 8. Seek advice from trusted colleagues. Get a second, third or fourth opinion from people whose opinion you trust. Don’t just ask family members who might be eager to please. 9. Make sure your contact details are up-to-date. If your phone number or email address changes, let OP know! If staff can’t contact you, they can’t tell you you’re a winner. 10. Enter the competition. It’s easy to feel intimidated by the quality of other photographer’s work, but the only sure way to improve your chances of winning is to enter. We are delighted to announce that our competition to find 2015's Outdoor Photographer of the Year is now open for entries. Following the success of last year’s competition, we have once again teamed up with Fjällräven to offer the prize of a lifetime: the overall winner will be off to the Arctic on the Fjällräven Polar dog sled expedition in spring 2016! All adult category winners will receive a superb Fjällräven Kaipak 28 backpack and £200 cash. This year, for the first time, we will also be producing a beautiful photography book of the winning, commended and selected other entries from the 2015 competition. Outdoor Photographer of the Year is open to all professional and amateur photographers aged 18 and over, with categories covering landscape, wildlife, travel, adventure and the underwater world. There is also a free-to-enter Young Outdoor Photographer of the Year category for those aged 18 or under. Although Outdoor Photographer of the Year 2014 closed for submissions some four months ago, and we announced the winner 3 months ago, it is only now that the competition can really be said to be finished for 2014. That’s because Greg Whitton, overall winner of OPOTY 2014 has just returned from his trip-of-a-lifetime to the Arctic on the FjällrävenPolar expedition. Greg has posted a number of fantastic and revealing blog posts on his website, detailing a journey that had a “profound effect” on him. Here are the links, which include some gorgeous photos from the trip, featuring huskies, sleds, skylines and snow. Lots of snow. Fjällräven Polar 2015 Part 1 – “It’s a little bit funny, this feeling inside"
We’re pleased to be joined by Outdoor Photographer of the Year 2014 Overall Winner Greg Whitton, who has answered some of our questions. As well as the interview, below you’ll find a handy 4 minute highlights video from the OPOTY Awards Ceremony for you to enjoy. It’s been a week since you won Outdoor Photographer of the Year 2014 and found out you’d be going on a trip of a lifetime to the Arctic. How does it feel? Has it sunk in yet? How do you see this prestigious award impacting on your life as a photographer? For the first time since I first picked up a camera it feels like I have earned a little credibility and that my photos (for the most part) are halfway decent. You get a lot of feedback online these days but a lot of it is throwaway comments, all nice in their own way, but ultimately throwaway. This whole competition felt like it had a number of milestones for me and I think the decision by the organisers to release the shortlist to everyone was a bit of a masterstroke. It gave us all a greater understanding of the quality we are all in keeping with. I won't hide the fact that I was delighted to get 15 images shortlisted (which appeared to narrowly be the most by anyone), but what it did highlight to me personally was that I have a very broad range of subject matter interests and styles compared to most. For this competition that was clearly a benefit, but I think longer term I need to focus a bit more. Notwithstanding any of that though, I'm hoping the award might open one or two doors as I move forward. I still work full-time and I have no plans to give that up whatsoever, but with this award behind me I hope to be able to expand my profile as a photographer and hopefully grow beyond it just being a hobby. What are you most looking forward to about the Fjällräven Polar trip? I think the correct question is what are you not looking forward to on the Fjällräven Polar trip because most of it sounds absolutely amazing! I'm trying to equate it to what I know already, like Glastonbury Festival. I've been going every year for quite a while now and each year I love it, everything about it...except the toilets. I view the Fjällräven Polar in a similar way. I'm looking forward to spending time with the other Polarists, to the dogs, to using the kit they provide, to the landscape, to the sledding, to the survival techniques they will teach us, everything really. Oh, and last year they had the Northern Lights give them a show too...that would be pretty cool. How are you planning to prepare for the trip? Well, my wife has put me on a diet, no chocolate. I'm a heavy guy, but I'm reasonably fit because I hike a lot and go to the gym 4-5 times a week, so I'm just going to step that up a little. I'm also hoping for another cold snap so I can get out and practice taking photos on the move and with gloves on! Apart from that I'll take it as it comes I think. I don't know really. Like I said before, I work full-time and I don't plan to end that anytime soon, on a good day I really enjoy my job and it allows me to just enjoy my photography rather than see it as my main source of income. I'd love to get involved in a few more exhibitions and perhaps have my own at some point. I still feel as if I need to improve and expand my portfolio in order to make that work though. A lot of photographers seem to offer workshops and work with magazines, etc. Perhaps these are things I should look at more. If anyone wants some help with leading workshops, then give me a shout! In any case, I see this as just one more step forward, who knows where it will lead, but I'm open to anything. Greg Whitton named Outdoor Photographer of the Year 2014! UK landscape photographer Greg Whitton wins Outdoor Photographer of the Year 2014 with his image Southern Highlands, Iceland. Greg has won an exclusive place on the Fjällräven Polar dogsled expedition – an unforgettable life experience where he’ll travel more than 300km over six days across Arctic Scandinavia. His photograph was chosen out of more than 10,000 images that were entered by professional and amateur photographs from around the globe. The news was announced at the Outdoor Photographer of the Year awards ceremony on Sunday 15th February at the Telegraph Outdoor Adventure & Travel Show, London Excel. The event was streamed live so people all over the world could watch the ceremony. You can watch the recording below; the footage of Greg being announced as the Overall Winner can be found 2 hours and 20 minutes into the video. British mountaineer Alan Hinkes OBE presented Greg with his prize. Alan is the first Briton to climb the world’s 14 peaks higher than 8,000 metres and is one of the only 12 people alive who have achieved this feat. 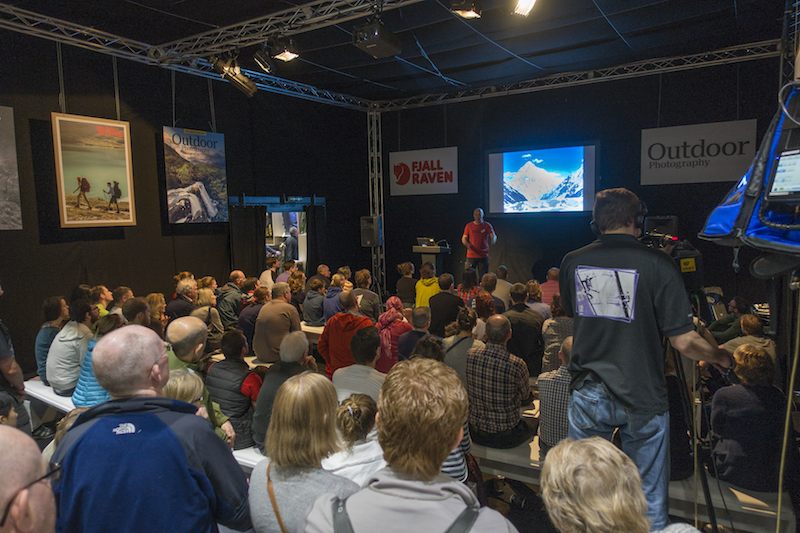 As well as the OPOTY awards ceremony and exhibition, Outdoor Photography were delighted to present a series of excellent presentations on their Photobox stage at The Telegraph Outdoor Adventure & Travel Show. Highlights included Alan Hinkes discussing ‘Climbing the World’s Highest Mountains’, Andy Parkinson on ‘How to take Awesome Wildlife Photos’, and Ben Pipe on ‘How to shoot powerful travel photos’. 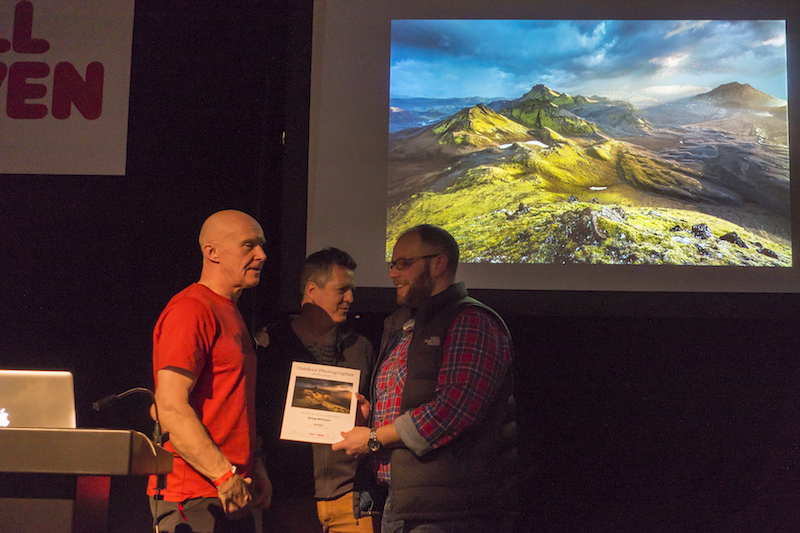 Thanks to everyone that entered OPOTY 2014 and to those who came along to The Telegraph Outdoor Adventure & Travel Show or watched the live stream online. This Thursday, 12th February 2015, marks the start of the Telegraph Outdoor Adventure & Travel Show. Outdoor Photography magazine are delighted to once again host the PhotoBox stage. As well as 4 days packed full of the very best talks on all aspects of outdoor photography, we’ll also be exhibiting the Category Winners and Commended Images from Outdoor Photographer of the Year 2014, and announcing the overall winner. 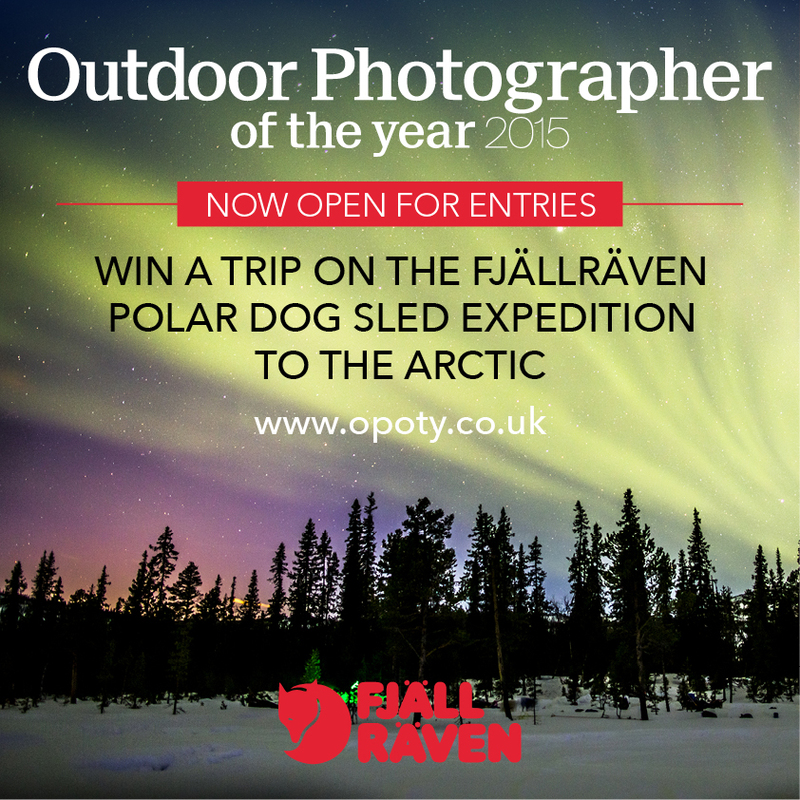 ‘Fjällräven is deeply honoured to be involved with the OPOTY competition. We were awed at the number of entries and overwhelmed at the quality. I attended the judging to witness firsthand the process of making decisions on the category winners. The enthusiasm, dedication and discussions that took place over the entries were incredible. Everyone's submission was treated fairly and with great respect. The overall winner, when announced at the Telegraph Outdoor Adventure & Travel Show, will have the joy and unique experience of the Fjallraven Polar 2015 to look forward to. Fjällräven will be at the Telegraph Outdoor Adventure & Travel Show at London ExCel from the 12-15th February, and have also sponsored the Outdoor Photography PhotoBox lecture theatre, alongside their stand. They will be showcasing an authentic Fjällräven Polar dogsled and clothing, brought over from Sweden for the event, and their amabassador the mountaineering legend and photographer Alan Hinkes will be speaking each day in the OP theatre. On the 14th January we announced the Category Winners of Outdoor Photographer of the Year 2014, and we've been blown away by the fantastic reception the winning images have received. As well as kind comments and congratulations from fellow outdoor photographers, the OPOTY Category Winners have also attracted the attention of the media. On 16th January, Greg Whitton's Light on the Land winner was one of The Telegraph's Pictures of the Day and Shaun Walby's By the Water's Edge winner was The Sun's Picture of the Day. You know that nice shot you took on one of your rare trips into the great outdoors? Delete it. Put it out of its misery before you compare it to the category winners of 2014's Outdoor Photographer of the Year competition. Mystical landscapes, atmospheric ascents and a perfect oryx! Well, my entry didn't make the final, but seeing the winners, I'm not surprised. Such stunning work! This international competition received well over 10,000 entries and to be chosen as one of the six adult class category winners is simply a 'wow' moment for me. Great news: I'm the Outdoor Photographer of the Year 2014, Wildlife Insight winner! Wow!! Not only Category Winner, but also commended in the OPOTY competition! I'm so proud!! So proud to see my son's image amongst the superb category winners of 2014 OPOTY! Entry for OPOTY 14 may now be closed, but Christmas is fast approaching and presents must be chosen. As outdoor photographers, we assume that you surround yourself with kindred spirits who are most at home when out in the great wilderness. This particular type of person, we know, can be difficult to buy for. Luckily for everyone involved, OPOTY’s wonderful sponsor Fjällräven have something for all the adventure-loving outdoor enthusiasts and photographers in your life (including yourself, of course). To help you out even more, we’ve put together our Christmas Wishlist, which is full of highly practical and stylish items perfect for being wrapped up and placed under the tree until Christmas day. The name says it all really. It’s a classic design that’s stylish, hardwearing and hugely practical and it’s just as good now as it was when first released in 1978. Colour Choice: We’ve chosen the two-colour Royal Blue and Ox Red but there are a great variety of colours to choose from. It’s also available in a number of styles, including a 15” laptop version with a specifically designed padded compartment for that most useful of digital wonders. What makes the Greenland Winter Parka so good is that it’s tough and warm enough to be worn for walks in the woods and on the hills, but stylish and lightweight enough for everyday use. Colour Choice: We’ve chosen Uncle Blue, wouldn’t say no to the Autumn Leaf version either! Like the Greenland Winter Parka, the No.1 Down Jacket is stylish and comfortable. It’s down padding means that it’ll keep you toasty no matter the weather. As Fjällräven are dedicated to only using down that is ethically sourced, you can also rest comfortably in your new jacket. Colour Choice: For us it has to be the Sand / Tarmac variety. It’s perfect as it’s muted enough to fit into any situation, but has a splash of colour thanks to the bright blue interior. The Louise is a gorgeous and snug wool jumper, which is ideal casual winter-wear. What we love most though is the large contrasting Fjällräven logo on the front, which is the knitwear equivalent of bling. Colour Choice: The Grey, everyday. They’re all great, but the Fjällräven logo just works perfectly in the grey. There’s always one. You know, the expert, the one that claims they are master of all terrains, the one with everything they could ever need for trekking in the Himalayas, sledding across the arctic and crossing the Sahara. Well, we reckon they won’t have one of these! It’s a brilliant gift for the avid camper in your life, because what use is a tent that keeps being blown away on the beach? Colour Choice: Red. It may spend most of its life in the ground, but while it’s out and about it may as well look good. What makes an Outdoor Photographer of the Year? When imagining the person who will be awarded this year’s Outdoor Photographer of the Year (OPOTY), we probably conjure up scenes of guys and girls out there whatever the weather taking pictures. Whether it’s for fun or to earn a living, being an outdoor photographer can be demanding. When it comes down to looking at the OPOTY competition entries and picking a winner, it can sometimes be easy to forget what went on behind the scenes to get a particular image. So, firstly, I’d like you to appreciate the work that goes into creating outdoor photographs. I try to keep this in mind when judging photo competitions, yet in my eyes a picture that was demanding to produce doesn’t necessarily make it a winning image. Sometimes an image of scene that just appeared in front of the photographer as they got out of their car in a car park could be worthy of first place. The fact of where it was taken is not the point. The point is that the photographer was out there (and who knows how many times they’ve gone there before) and knew when to take the picture. They invested a lot of time in learning this skill, so why not use a little luck to their advantage as part of the process? Although I think embracing luck is important, I’ve spent a lot of time and money trying to remove chance from a photo shoot. Working as a commercial adventure sport photographer, I’m commissioned to deliver a high quality product. I always say that what my clients are paying for is a guarantee that they’ll get the results they expect. Sometimes the amount of money spent on producing an image seems to get the credit for great photography. But that shouldn’t be the case, all that money is buying is the professional’s time and their production skills. A common theme in most of the pictures I take, and the images I drool over, is that they have people in them. In previous OPOTY competitions I’ve judged, photos with people have been pretty rare but it is definitely something I’d like to see more of. Adding people (trust me on this) gives another element to an image and shows the photographer’s skill. The bigger the number of people in a picture, the higher the skill of the photographer – so hats off to wedding photographers! The person awarded Outdoor Photographer of the Year doesn’t have to have spent loads of money to produce a winning image, it’s just about getting out there, using a little bit of luck and (for my preference) including people in the scene. In early December 2012, Steve emailed to say that my image "Southbourne beach" was the winner of the At the Water's Edge category in the 2012 OPOTY competition, and would I attend the Outdoors Show in London's Docklands in January for a presentation. I was fortunate to win the same category in the inaugural competition in 2010, so I was really pleased that an image of my (almost) local patch was the one that was chosen, especially in a category that's so very dear to me. Southbourne is a little east of Bournemouth and nestles alongside Boscombe on a quieter section of the beach that effectively stretches from Hengistbury along to Poole. I had followed a storm from Southampton to Southbourne, and as these usually break up across the Isle of Wight, thereby ensuring really interesting weather patterns at Southbourne, I arrived at Southbourne a little early ahead of the impending stormy weather. A good thing about Southbourne is that there are undulations at the shoreline in the sand between the sea groynes, and these can produce absorbing sea trails. It was really a case of choosing one of these and ensuring a sufficiently low shutter speed to produce a pleasing wave pattern. That’s the excitement really and part of the reason for being a committed coast hugger. Consequently, on Saturday 19 January 2013 I went to the ExCel centre in Docklands to attend the OPOTY presentation. Having spent the previous dawn in splendid isolation in a snowy New Forest, ExCel was a little busy. All the OPOTY category winners and runner-ups were printed by theprintspace and displayed around the stand. The OPOTY presentation was excellent – each category winner came up to the stage and said a few words about their image, which was displayed on a large TV. The overall winner was to be announced live at the show, and it was… me. Overwhelmed is an understatement! Afterwards I took in the inspirational talk by Pete Bridgwood on the ‘Dynamic Landscape’ and then went for a beer with the mighty man himself. During Easter 2013, Pete emailed to ask if I wanted to show my work at his Masters of Vision exhibition at Southwell, which was to open in late July 2013. During that opening weekend I met David Breen and Dav Thomas from Triplekite Publishing. I knew of David's photographic work and of course of Dav's book, With Trees. In early August, David suggested a book based on my Sea Fever project part of which had been exhibited at Masters of Vision. The book was subsequently published in November 2013. Aside from the previous exhibitions, almost all my work was seen digitally. I went away for a photo trip with Pete in May 2013, during which he said that I took control over all my image process until the printing, which was left to someone else. Why didn't I try printing? As a consequence I bought an Epson 3880 and acquired some excellent cotton rag paper (Fotospeed SC300) and started printing. It's very much a learning process but I love it. In today's digital world, an A2 print on 315gsm cotton rag paper is wonderfully tactile to hold. So the consequences of being the OPOTY 2012 winner has been being an exhibitor at Masters of Vision, getting a book published, being interviewed about my work across many magazine platforms, undertaking my own printing, developing relationships with galleries and exhibition spaces, and of course, a friendship with Pete. All thanks to a photograph of a local spot. I'm really keeping an open mind about what could constitute a winning image for this year's OPOTY. Current inspiration is drawn from a wide variety of sources, especially from the various online communities that include the free exchange of ideas, and links to work, projects and exhibitions. I'm just so pleased to be part of it this year. TELL THE WORLD ABOUT OPOTY AND YOU COULD WIN A COLLECTION OF GREAT PRIZES! In need of a Gorilla Pod? Fancy a Lomography Konstruktor SLR camera? How about a 6-month subscription to Outdoor Photography*? To be in with a chance of winning this fantastic collection of prizes all you need to do is tell your friends, family and colleagues about OPOTY 14 on social media. 1) Choose your social media! We’re running this contest on Twitter, Facebook and Instagram. If you post on all three, you’ll get three entries! 3) Post the message using your own account. Easy! You have until 2.30pm on Friday 12th December to enter this contest and we’ll announce the winner at 4.30pm on that Friday! And speaking of entry deadlines, don’t forget to submit your own entry to OPOTY 14 by Sunday 14th December to be in with a chance of winning a trip to the Arctic. If you’re really good, you could even win both contests! 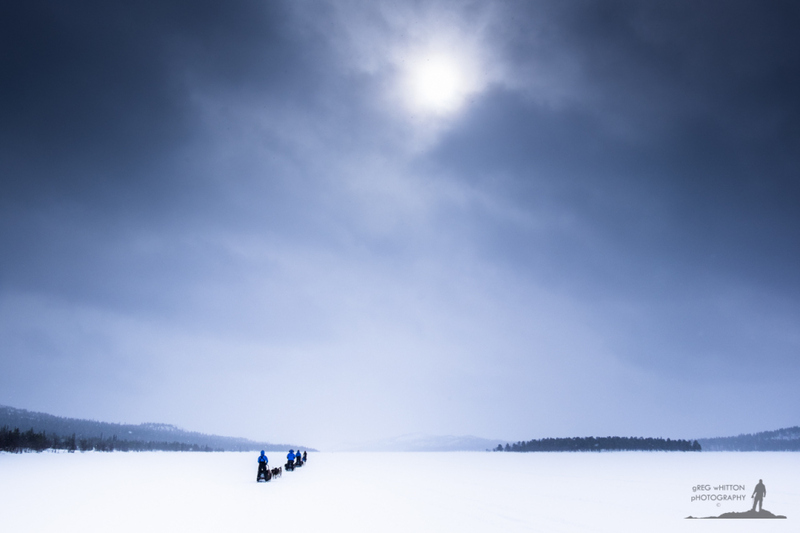 The Fjällräven brand and its extensive catalogue of high-quality outdoor equipment was born in the unforgiving landscape of northern Sweden, and the winner of the Outdoor Photographer of the Year 2014 award will be embarking on the trip of a lifetime to the Arctic next year on the Fjällräven Polar 2015 expedition. Whilst most of us don’t live in quite such harsh conditions as these, it’s still vital that we understand how to prepare for the outdoors during these long winter months. Thankfully, Fjällräven’s Polar Guide offers insights and advice into surviving the cold, which can be adapted to almost any winter landscape. The overall winner of Outdoor Photographer of the Year 2014 will be heading off to the Arctic to take part in Fjällräven Polar 2015, but what does that really involve? We're pleased to present the official Fjällräven Polar movie from the 2014 expedition, which gives a great insight into what you can expect. Fjällräven Polar 2014 from Fjällräven on Vimeo. How do you fancy heading off to the Arctic in spring 2015 on the adventure of a lifetime? 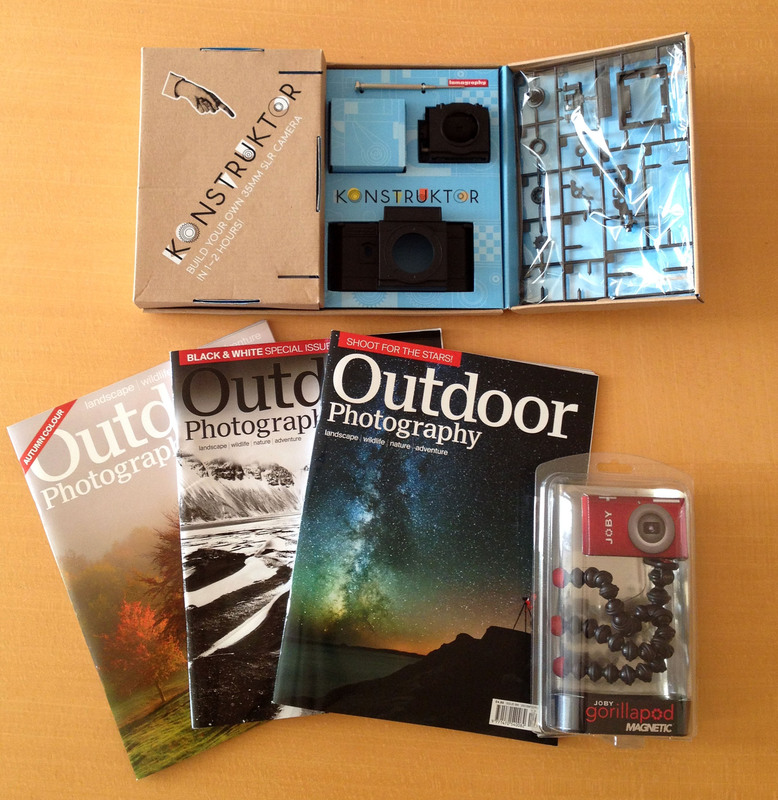 That's the amazing prize awaiting the overall winner of this year's Outdoor Photographer of the Year competition. Back in April this year, I was fortunate enough to go on the Fjällräven Polar 2014 expedition, and it was an experience that I and the other 20 participants from around the globe will never forget. It was hard to imagine that we could get on a plane to Norway with little more than hand luggage (and camera equipment for my sins) and then be heading off into the arctic wilderness for four days. Although I have been on many adventures in my life, I felt trepidation at taking on an environment as unrelenting and unforgiving as the Scandinavian Arctic. In good weather, it offers the most extraordinary scenery and feeling of being 'out there' that you can find anywhere within Europe. On a bad weather day, it can seem like the outside world has disappeared, and the survival instinct comes to the fore. Over the course of four days dog sledding from Norway to Sweden, we not only learnt how to effectively use the equipment supplied by Fjällräven, but we also realised the importance of every word spoken by winter survival expert and Fjällräven head gear tester Johan Skullman during his skills sessions. There was no doubting that the right equipment and knowledge could allow just about anyone, from any walk of life, to venture into the wildest places in the most inhospitable conditions, and not only survive but absolutely thrive. 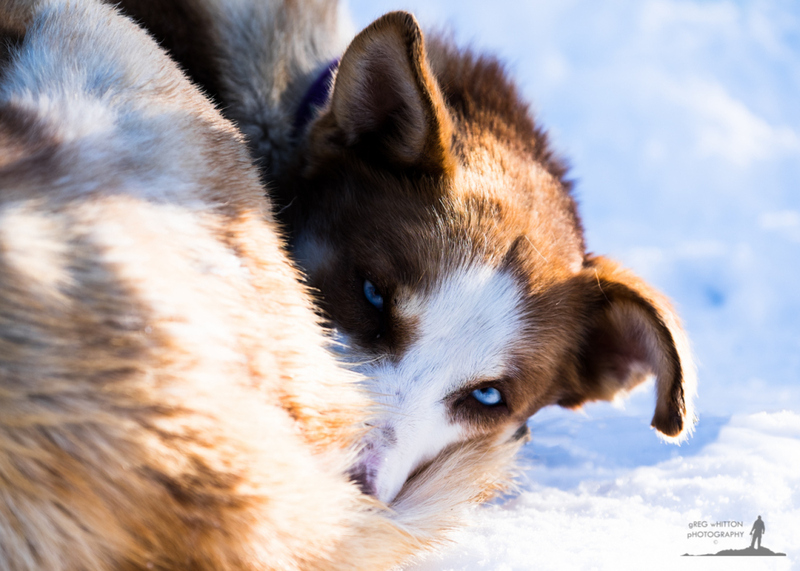 Strong and enduring human friendships formed, of course, but the relationships the team members built with their dog teams over the course of the expedition meant there were more than a few tears as the inevitable parting of ways came at the end. Despite hardly anyone on the trip having much prior experience of these sorts of conditions or activities, I don't think there was a single participant who wouldn't have wanted another week or more bolted on to the experience when we got to the finish line. The yearning for the Arctic still burns inside me, some six months after my return home. The best thing about this prize, of course, is that it is something that money can't buy. You can either win Outdoor Photographer of the Year 2014 or you can enter the Fjällräven Polar competition directly to attempt to secure a spot. Either way, if you happen to be one of the chosen ones, there is no risk of your friends and family coming up with the retort "Oh, I did that too,' when you start regaling them with stories of your Arctic adventure.